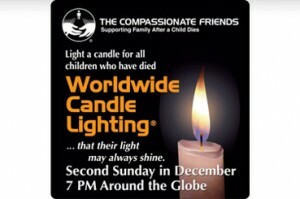 Now believed to be the largest mass candle lighting on the globe, the Worldwide Candle Lighting, a gift to the bereavement community from The Compassionate Friends, creates a virtual 24-hour wave of light as it moves from time zone to time zone. Hundreds of formal candle lighting events are held and thousands of informal candle lightings are conducted in homes as families gather in quiet remembrance of children who have died, but will never be forgotten. In 2009, information was submitted to TCF’s national website on services in 15 countries outside the United States. In total, we received nearly 530 services. TCF has been joined in recent years by chapters of several organizations including MISS, MADD, Parents of Murdered Children, SIDS Network, Gilda’s Club, and BPUSA and services were held in all 50 states plus Washington D.C. and Puerto Rico. There is no way to know how many hundreds of additional services were held in the U.S. and around the world without the information being to us. The Compassionate Friends and allied organizations were joined in 2009 by local bereavement groups, churches, funeral homes, hospitals, hospices, children’s gardens, schools, cemeteries, and community centers. Services have ranged in size from just a few people to nearly a thousand. You are also invited to post a message in the Remembrance Book which will be available during the event at TCF’s national website. Last year in that short one day span, thousands of messages were received and posted from every U.S. state and Washington D.C., every territory, as well as dozens of other countries, some in foreign languages. The Remembrance Book will remain accessible to read until the 2011 Worldwide Candle Lighting. Here in the United States, publicity about the event is widespread, being featured over the years in Dear Abby, Annie’s Mailbox, Ann Landers column, Parade Magazine, Guideposts magazine, and literally hundreds of U.S. newspapers, dozens of television stations, and numerous websites and hundreds of personal blogs. Information on the Worldwide Candle Lighting and planned memorial candle lighting services (of which we are advised) is posted on TCF’s national website every year as the event nears. If no Worldwide Candle Lighting service was held near you in 2009, please feel free to plan one open to the public this year. You are welcome to use TCF’s “Suggestions to Help Plan a Memorial Service in Conjunction with The Compassionate Friends Worldwide Candle Lighting©” to help in planning the service. All allied bereavement organizations, churches, funeral homes, hospices and formal and informal bereavement groups are invited to join in the remembrance. The Worldwide Candle Lighting gives bereaved families everywhere the opportunity to remember their child . . . that their light may always shine!